A tour around one of London’s engineering marvels, dubbed the ‘eighth wonder of the world’. There’s nothing I like better than poking around in unusual parts of London. I’ve climbed to the top of crumbling church spires, wandered along Tube tracks at 2 in the morning and waded through the sewers (twice). 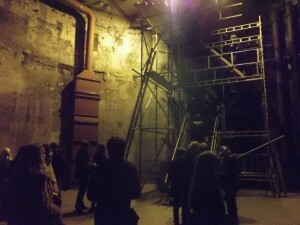 But last weekend, I was lucky enough to get a tour of a space that had remained completely inaccessible for 140 years – the ventilation shaft to the Thames Tunnel. Quick bit of history. The Thames Tunnel was carved out beneath the river from 1825 to 1843 by French engineer Marc Brunel, with assistance from his then unknown son Isambard Kingdom Brunel. It was the first tunnel underneath a major river in the world, and was known as the Eighth Wonder of the World. When it opened in 1843, hundreds of thousands of people walked through it in its first weeks. Soon, a shopping arcade was established in its arches. This soon fell into disrepute as ‘ladies who are no better than they should be’ began to colonise the darker crannies. After a shortlived time as an underwater fairground, the tunnel was converted for rail use. It’s a purpose it still performs to this day, carrying the London Overground Line beneath the river. This was the world’s first ‘caisson’ – an engineering technique invented by Brunel Senior whereby a pre-constructed drum of steel is sunk into the soft earth by the force of gravity, and then hollowed out by workers. Construction was treacherous. Ten men died when a tunnel breach sent a tide of river water flushing along the passage. IK Brunel himself almost succumbed. His unconscious and battered body was plucked from the water inside the caisson space. During work to prepare the tunnel for the London Overground line, a concrete raft was fitted at the base of the shaft, just above the train tracks. It is now possible, for the first time in nearly a century and a half, to clamber down into the shaft and see the famous engineering marvel that so many Victorian’s flocked to visit. It’s tricky to take photos in such a dimly lit space, so here are a few seconds of video to give you a feel. The voice is that of Brunel Museum director Robert Hulse. Note the walls caked with Victorian steam-train smoke, and the helical line where the staircase once climbed the chamber walls. The chamber will now be converted into an exhibition and events space for the museum. Until then, you won’t get many opportunities to visit, but the next one will probably be Open House weekend in September. However, the museum is open all the year round and well worth a visit if you’re not familiar with the story of the tunnel. Thanks Matt I feel like I have had an interesting history lesson as well as a trip down the shaft myself. I will keep an eye out for the next opportunity to go down and visit the eight wonder of the world- a really unusual day trip that’s for sure. Brunel Museum hosts great tours and I am looking forward to the day they resume their floodlit train tour.